It is said one should say “Shahr” or “The Month of” before one were to mention the word “Ramadhan”. However, is it forbidden or only disliked? Is there any atonement for saying it? What does “Ramadhan” mean? Ameer al-Mu’mineen [Ali] (as) said: “Do not say Ramadhan, but rather, say: “The Month of Ramadhan” [Shahr Ramadhan], for you do not know what Ramadhan is. Reference: al-Kafi, Volume 4, Page 69, Hadith #1; Man Laa Yahdhuruhu al-Faqih, Volume 2, Page 112, Hadith #480; Ma`ani al-Akhbaar, Page 315, Hadith #2; Wasaa’il al-Shia, Volume 10, Page 319, Hadith #1 / 13504 (See First Image below). This hadith is the strongest one we have in relation to the chain of narrators – however other hadiths are supplemented by this – and also give insight as to the reason why we are told to always say “Shahr/Month”. [The narrator said] We were eight men with him [Abu Ja`far [al-Baqir] (as)] and we mentioned Ramadhan. He (as) said: Do not say “this is Ramadhan”, nor “Ramadhan has passed”, nor “Ramadhan has come”; for Ramadhan is a name from the names of Allah (azwj), [and He] does not come or pass. Indeed, the perishable is what comes and passes. Therefore, say: “The Month of Ramadhan” [Shahr Ramadhan], for the month is appended to the name, and [this] name is the name of Allah, and this is the month in which the Qur’an descended. He made it an example and a `eid. Reference: al-Kafi, Volume 4, Page 69, Hadith #2; Wasaa’il al-Shia, Volume 10, Page 319, Hadith #2 / 13505 (See First Image below). Al-Ridha (as) said in a hadith: “Indeed, Ramadhan is a name from the names of Allah, so do not say “Ramadhan has come or passed or arrived”, for the month is the month of Allah [Shahr Allah] and it [the month] is appended to it [the name of Allah]. Reference: Fadhaa’il al-Ashhur al-Thalaathah; Wasaa’il al-Shia, Volume 10, Page 320, Hadith #5 / 13508 (See First Image below). Finally, we look at whether this discouragement from the infallibles is to suggest that it is Haraam (forbidden) or Makrooh (disliked), and if there is any Kaffarah (atonement) for saying it. First, we analyse the following hadith. Ali (as) said: Do not say Ramadhan, for you do not know what Ramadhan is. Whoever says this, let him pay charity and fast as an atonement (kaffaarah) for him saying it. You should say as Allah (azwj) said: “Shahr Ramadhan” [The month of Ramadhan]. 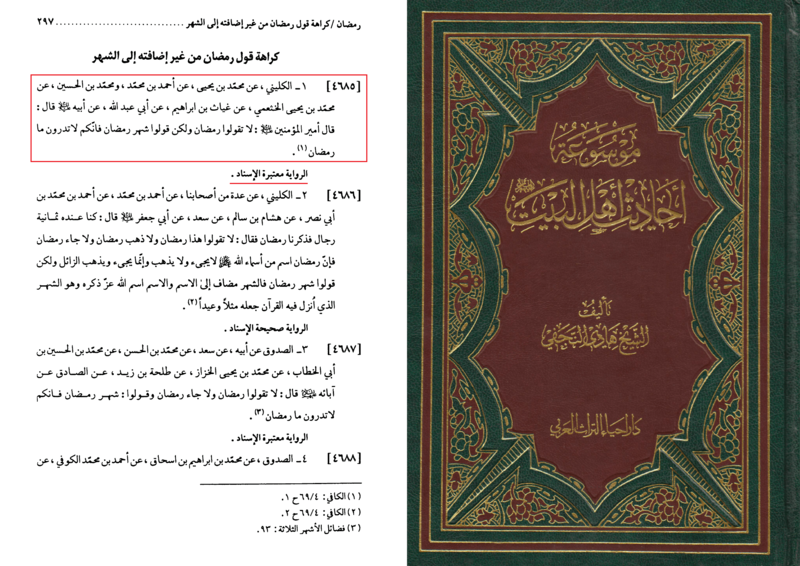 Reference: Iqbaal al-A`maal; Wasaa’il al-Shia, Volume 10, Page 320, Hadith #3 / 13506 (See First Image below). The apparent of this hadith suggests that not only is it Haraam (forbidden), but there would need to be an atonement of charity along with fasting for saying “Ramadhan” without appending “Shahr” to it. However, we must note a few things. One: The chain is weak according to the standards of most Maraja’, thus, it is not a hujjah (proof). 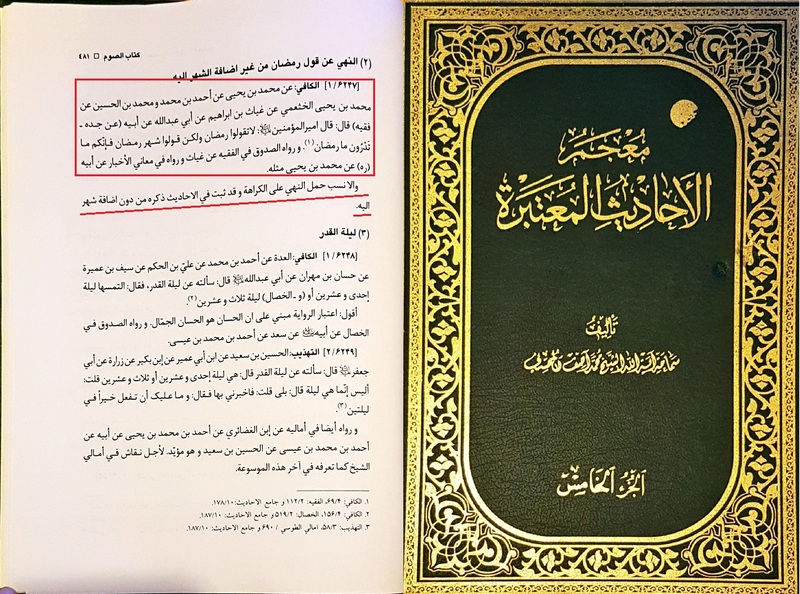 This is also backed up by al-Majlisi (See Mir’aat al-Uqool, Volume 16, Pages 213-214, See second Image below) and al-Muhaqiq al-Bahraani (See al-Hadaa’iq, Volume 13, Page 14-15). “The discouragement is based upon Karaaha (disliked, but not forbidden) since it is established in the narrations the mentioning of it [Ramadhan] without the addition of “Shahr” to it. (See Third Image below). Therefore, leaving out “Shahr” would only be a Makrooh (disliked) act, and not Haraam (forbidden). As for the meaning, or origins, of the word “Ramadhan” and how that links back to Allah (swt), we find there is a few possibilities. 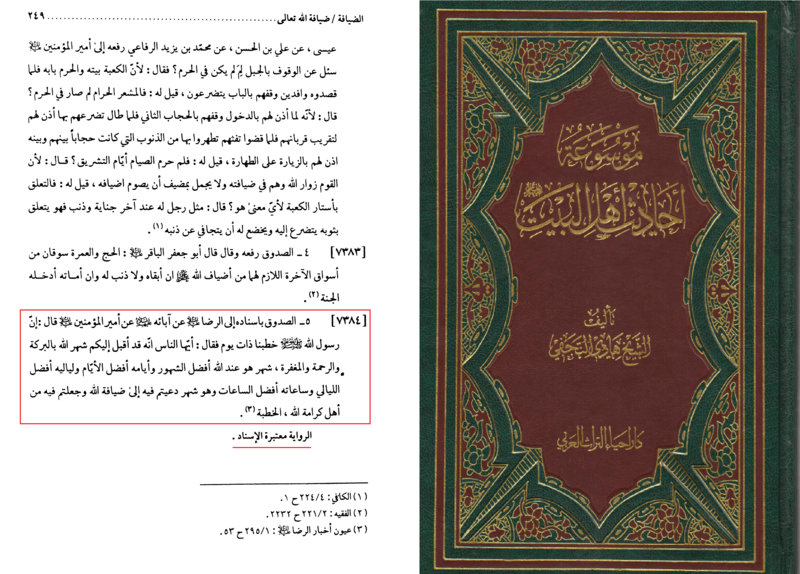 al-Majlisi relates this discussion in Mir’aat al-Uqool (Volume 16, Pages 212-213, See Second Image below). Here is a summary of the possibilities. 1. الرمض (al-Ramdh with sukoon on the meem) – Which is the rain that comes down in autumn, which cleanses the surface of the earth from dust. Thus, the Month of Ramadhan was named after this because it cleanses the bodies from filth and brunt. 2. الرمض (al-Ramdh) – Which is the intense heat from the sun, or the burn due to the excessive sun-heat reflecting upon the desert sands. Thus, the Month of Ramadhan was named after this either because the people burn (suffer) due to excessive hunger – or because their sins burns (wiped away) during the month. 3. It was named this because the people of Ignorance used to burn (يرمضون) their weapons in preparation for the sacred months (where blood-shed was banned). 4. It was named this in the times of old in which it coincided with the weather being extremely hot/burning – and thus it stuck to that name in time. When looking at the first two meanings, one may also apply this to the meaning behind it being a name of Allah (swt), in that He (swt) is the one who cleanses and burns away the sins. May Allah (swt) bless us all during this month and increase us in faith & knowledge.